Limit the stuffings to your favorite vegetables with pleasing textures and tastes and deep fry the rolls in a small amount of oil quickly. 1. Heat one Tbsp of oil in a shallow pan to medium high heat. Add the chopped vegetables and stir until desired consistency. Less frying, crunchier the texture, lower the calories, and higher the vitamin retention. 2. Stuff the vegetable mix into an egg roll skin, set aside. Repeat until desired number of eggrolls are stuffed. 3. Put oil in a shallow pan for frying. 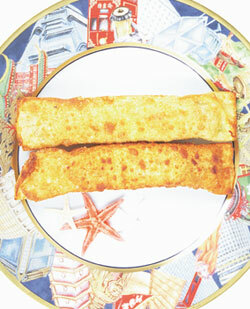 When heated enough for edge of an eggroll to sizzle, place the egg roll in the heated oil and quickly cook each side. When the skin is lightly brown with bubbles, roll over, and cook the other side. 4. Serve with rice and soy sauce. Refrigerate the leftover eggroll skin for later use.